Confessions of a Single Parent Pessimist: Mummy Downtime: Online Gaming! I don't know about you, but since having Chunk, I have found it really difficult to just switch my brain off...ever. I have gone from being one of the laziest women known to man, to a girl that cannot cope with sitting still for five minutes without scrawling through a mental checklist of things that need to be done. I think it's because when Chunk was a tiny baby, I quickly got into the habit of using whatever five minute naps he would have to get things done, such as showering, prepping dinner etc, as otherwise he wouldn't allow me to get it done. As he's got older, and more lively, this has carried on, because he now rarely naps at all (sob) so every spare minute is used on doing things I can't do when he's around. It's turned me into an OCD freak that cannot just switch off, and after two years of this I've decided to try to find ways to get some mummy downtime. My first idea has been to play online games. I used to play Bejeweled and random Facebook games loads pre-Chunk, as they were great ways to relax, or fill the time when waiting for health appointments or going on long journeys on the train. 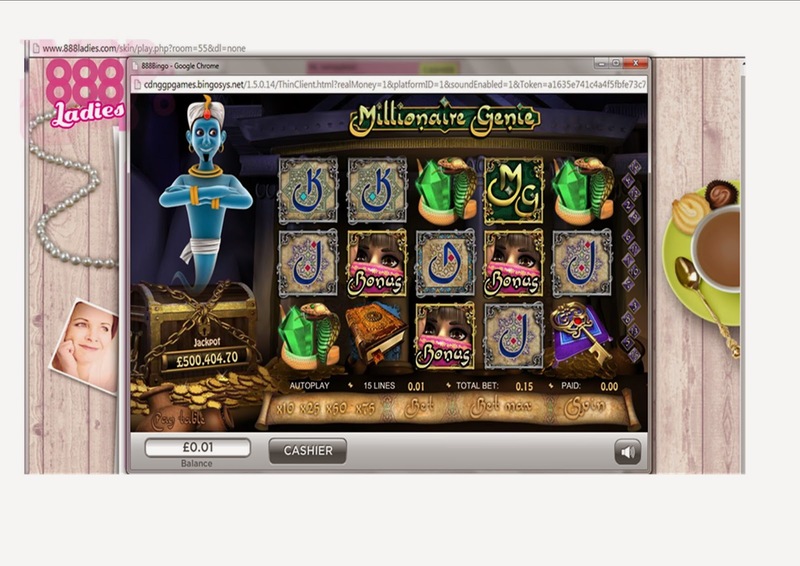 So I jumped at the chance of trying a new game called Millionaire Genie by 888ladies. I got given £5 to try it out with, and decided to bet small amounts initially whilst I got the hang of it. When you place your bet you start to see lots of symbols such as bags of gold, cobras and magic lamps spinning around on the reels, whilst the Genie sits on am ever-growing treasure chest of cash. To win, you need to create matching combinations of the symbols on one of the 15 pay-lines. There are two special symbols in the game: The Genie and the girl in the pink scarf. The girl is like a bonus symbol, so if you find more than three of her, this triggers the Genie's Palace bonus round, where you make two wishes. One wish decides you prize, and the other decides the multiplier that comes with it. The scatter symbol (Genie's close-up shot) gives you a series of free games if you manage to get three of these on your reels. You can play it one spin at a time, or you can pre-set it to do 75 spins for you, so you can sit back and watch it play whilst you have a cuppa! For a little while I didn't understand how anybody could win the huge sums of money that this game is based on, as I was only winning 15p or 75p a time, but then I noticed that the longer you play the game, the higher your chance of winning bigger money is. So the big money is literally awarded at random, so the only way you can up your chances is to play as much as you can! Once I worked this out, i really enjoyed the game, and it really did take my mind off the washing up, redecorating and blog writing to do lists that usually float through my head at night. I also noticed the site has other games like Bejeweled, so that will definitely be the next one I try! Fans of the Millionaire Genie, or any other games on the site, can vote here for them to win an award. Please gamble responsibly and only bet what you can afford to potentially lose. This is a sponsored post. For the purpose of this post I was given £5 credit to play the game. All opinions are honest and my own.